Half-way across the bridge heading east out of St. Louis, we crossed the state line into Illinois. Like most people who are not from the area, the only thing that comes to mind when talking about Illinois is Chicago, so the drive through southern Illinois came as quite a surprise. Far removed from the vibrant city life of Chicago is a land filled with trees and almost no people, houses or places to eat or refuel. As we drove through this area, I couldn’t help but think that this is what it must feel like to drive through the desert on the way to Las Vegas, the only difference being trees instead of sand. We finally found a place to eat as we approached the Indiana state line, but it was still a far cry from Chicago. The Subway that we found off the beaten path had a redneck feel that made you forget that you were in the Midwest. I can honestly say that this is the first time that I had to navigate around a gigantic dead bird in the road. My wife and I still aren’t sure if it was a wild turkey or a buzzard, but either way, it was very strange to see. Driving through Indiana was much the same as the drive through Illinois. The only point of interest was seeing road signs and billboards for a town called Santa Claus. And though Indiana couldn’t compete with the crazy road signs that we saw in Missouri, there was one that we found while pulling off the road to go to a gas station. The sign read “Prison Area – Do Not Pick Up Hitchhikers.” Maybe it’s just my upbringing, but I’ve always been taught never to pick up hitchhikers in any area, not just prison areas. After a few detours and some construction traffic, we ended up getting to Louisville a bit later than expected. We checked into the hotel, dropped our stuff off in the room, and headed right back out to catch a Minor League Baseball game. We arrived at Louisville Slugger Stadium in the middle of the first inning of a game between the hometown Louisville Bats and the Syracuse Chiefs. We were all impressed with the five-year old stadium…even my little one. It took a few innings, but she eventually discovered the carousel and play area on the opposite side of the stadium. Journeying back to New York, it felt strange rooting against Syracuse, but since we had no allegiance to either team, it was more fun to join the crowd in rooting for the home team. The game was kind of slow early on, but ended in exciting fashion as the home team sealed the victory with some towering home runs in the late innings. Everyone had a great time at the game, but the highlight of our trip to Kentucky came the next morning when we visited the Louisville Slugger Museum & Factory. Before the guided tour of the factory where bats are manufactured, we spent some time exploring the exhibits. My son and I both got to pose for pictures holding Mickey Mantle and Cal Ripken Jr. game-used bats (something that even the most casual baseball fan can appreciate). 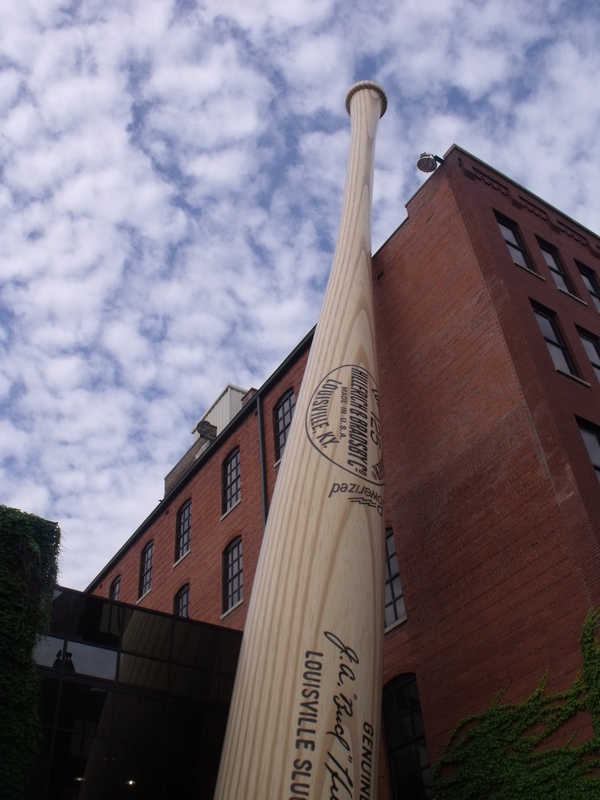 Seeing how the bats were hand-crafted when Louisville Slugger first started was interesting. Experiencing how they are made now with expensive machinery was amazing. What used to take 20 minutes now takes a mere 45 seconds to create. At the end of the tour, we were each given mini bats to take home as a souvenir. It’s a nice gesture, but one that seems to be kind of hazardous as kids can’t seem to stop themselves from swinging them without looking to see who or what is near them. I got my son a small bat with his name inscribed on it. This is a keepsake that he will undoubtedly treasure for many years to come. My son and I each took one round of swings in the batting cages when our tour was complete. The balls were only coming in at around 45mph, but that is still fast enough to hurt when the machine goes haywire and hits you in the ribs with a pitch. After I “took one for the team” in the batting cage, the operator explained to me that they had been having problems with that cage, which is why they were only letting the adults use it. Thankfully, I’m none the worse for wear, and now I’ll have a story to tell for years to come. Before we left to get back on the road, we took the opportunity to visit the Norman Rockwell exhibit which was on loan to the museum for a two-week period. It was very cool to see all of his original work. If not for this journey, it’s hard to imagine ever taking the opportunity to visit Kentucky to experience some great baseball memories. As a lifelong baseball fan, I’m glad that I got the chance to do this with my family. The final stops on our journey home will be in Ohio. I’ll post about our Ohio experiences soon.